This new 2 bedroom, 2 bathroom apartment is furnished to a very high standard, including a fully fitted kitchen, incorporating a washing machine, microwave oven and toaster. It is only an 5 min walk from Angel de Miraflores to a variety of different restaurants in Torrenueva, including Chinese, English, Italian, French, and Indian. Most of these restaurants have al fresco eating areas. Amongst the restaurants is the very popular 'Steve’s Bar' with regular entertainments. Also situated in this area is the local supermarket always stocked with a very good selection of fresh meat, bread, vegetables and all general provisions. There are larger supermarkets based in la Cala, Riviera Del Sol, Calahonda, also many bars, restaurants and banks. 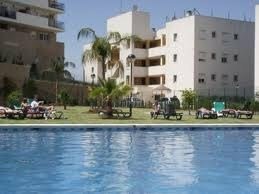 The Commercial Centre's at Marbella (La Canada) Fuengirola (Miramar) are well worth a visit. The nearest market is at La Cala held on Wednesday and Saturday. Markets are held every day of the week, details can be found in the local free newspapers. Puerto Banus with its impressive yachts, world famous fashion shops, Casino, shopping centre, top beaches and spectacular views, makes this place special. The night-life is buzzing with numerous bars and restaurants. Gibraltar has many attractions, St Michales Cave,Cable cars,Wild Dolphins and Barbary apes. A passport is required when visiting Gibraltar. Mijas is one of the prettiest villages in Spain, this traditional village has breath taking views. Tour this village on the famous Donkey taxis. Ronda is truly a spectacular village, famous throughout Spain for the plunging river gorge which divides this enchanting village. Ronda also has the oldest and most beautiful bullring in the whole of Spain.